VASSY will be joining us for the biggest party in ENTRADA history for a night you won’t forget! Raised in Darwin, VASSY is back, performing all her biggest hits after working with David Guetta, Tiësto and Afrojack! VASSY will be back in her hometown Darwin tearing up the stage exclusively at ENTRADA for one night only! 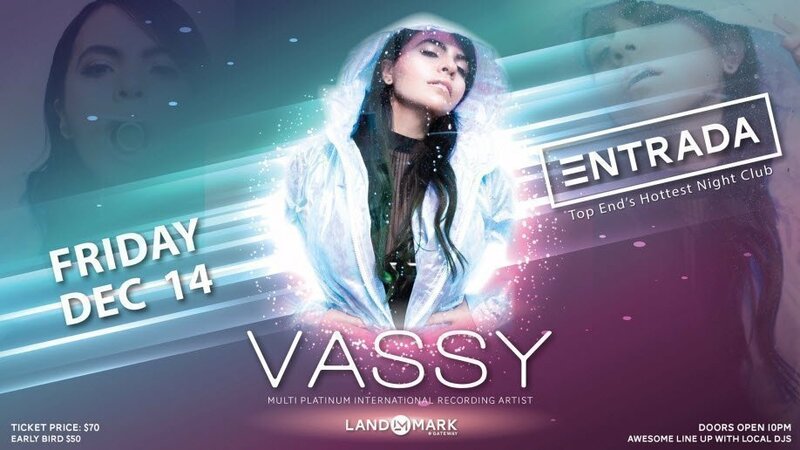 VASSY has performed in major EDM festivals around the world, including Ultra Music Festival, Tomorrowland Belgium, Electric Zoo NY, and Stereosonic Australia. This is your chance to see her LIVE, get your tickets today! Event Notes:THIS IS AN 18+ EVENT. Photo ID may be requested upon entry.